But now, jQuery plugins are out of style. People realized a few things. Recently, the jQuery plugin registry moved to NPM, like some other registries have (cordova etc.). If you look, there are about 2000 jQuery plugins in NPM to date. That's a lot, right? There are about 6 thousand hits in NPM for "react component". 6 freakin' thousand! There must be some really great stuff in there! 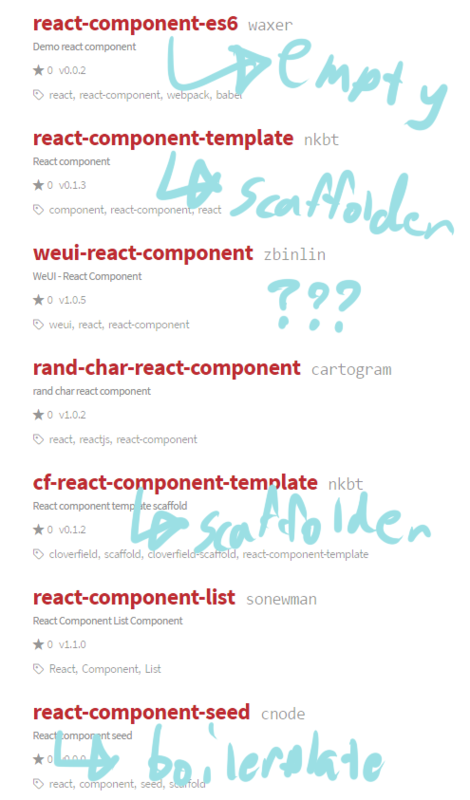 Out of the first six (excluding the non-english one), two were scaffolders, one was boilerplate, one was empty. Not a great start. rand-char-react-component is what it sounds like. It's a react component that gets set to a "random" character (when I say "random", I mean "a random choice in the author's chosen list"). It even has a fake test. I have to tell myself this sometimes too, but don't commit stuff to NPM that isn't useful to anybody but yourself. Npm is meant to be different from github. You can install packages from github URLs and it isn't hard. Even moreso, stop dumping empty repositories on there.